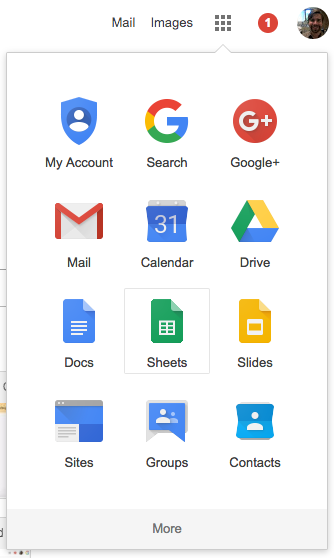 Google Forms are a powerful part of the Google Suites, or G-Suite as they now call it. 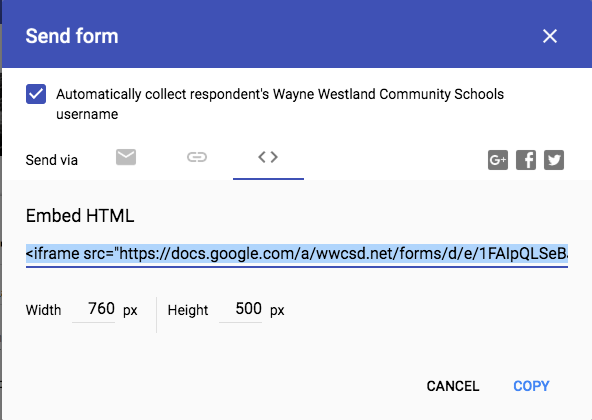 Forms allows you to create on-the-fly questions with a variety of answering formats that can easily be shared, emailed, or embedded into a webpage. You can create and analyze surveys right in your web browser—no special software is required. Even better, multiple people can work at the same time, and every change is saved automatically. First of all, make sure you’re signed into Google Apps! Now that you’re signed in, click the (waffle icon) to get to Google Forms. Not listed? Click the More option. This is what we’re looking for. At the time of this writing, you can create a form using a template, such as Blank, Exit Ticket, Blank Quiz, Assessment, or Worksheet. The forms homepage (link above) you see when first launching Forms will show your most recent forms. 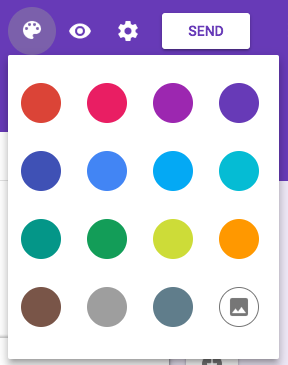 Google is all about colors, as I’m sure you’ve noticed. By default, choosing a blank form will look most likely like this above purple scheme. If you want to change the colors or add an image background this can be done very quickly. Change the color of header: Select the icon and choose your color. Select. Done. 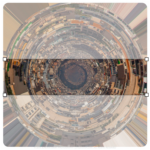 Set an image background, select the icon and either a) select one of Google’s backgrounds or b) upload your own image. Keep in mind you’ll have to crop the image to Forms preset ratio. One final note on design… The color of your form background itself (not the header) will adjust itself depending on the average color of your image or color selection. 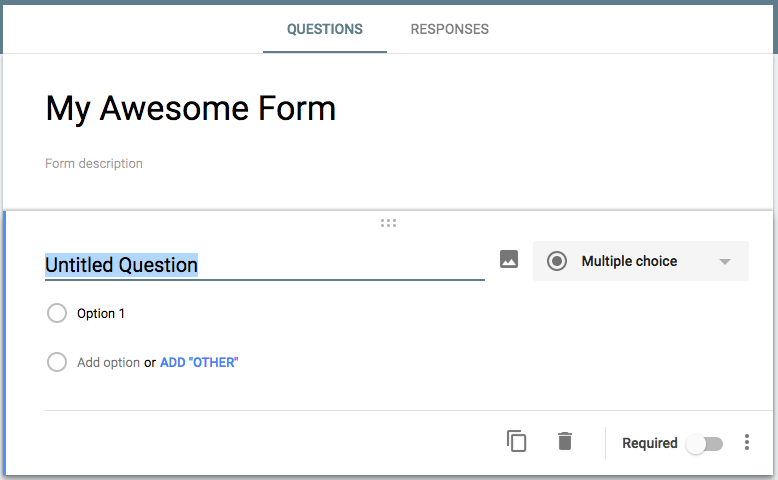 Before adding questions to your form, let’s give it a name. Look towards the upper left of your screen and click where it says “Untitled Form” and change it to be what it needs to be instead. You’re ready to get started, so let’s create our first question. Now just name your question and select the kind of answer you want. The default question type is multiple choice, as pictured above. However, you can pick any of these instead. Check out this chart below for the details. Short answer Type short answers. Ex: What’s one thing that can be improved in this course? Multiple choice Select one of several options. Ex: Which course did you take? Checkboxes Select as many options as they like. Ex: How did you hear about our organization? Select all that apply. Dropdown Select one option from a drop-down menu. Linear scale Rate options on a numerical scale. Multiple choice grid Select a point from a two-dimensional grid. Date Select a date from a calendar picker. Ex: When did you attend our conference? Time Select a time (either a time of day or a duration of time). Ex: What is the best time to contact you? Slide this to make your question required. Users will see a red asterisks * and will not be able to submit their form until that question is answered. Clicking the three dots will give you some additional options. One of these is description which can be really useful when clarifying what a question is asking. Currently, only “Text”, “Paragraph text”, “Checkboxes”, and “Grid” questions have support for validation. 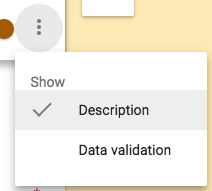 Each question type has its own validation settings. Number: Ensure the answer is a number of a certain type. For example, you can specify that the answer is a whole number or a number between 21 and 42. Text: Ensure the answer is text with a certain property. For example, you can restrict answers to text containing the word “lollipop” or only accept email addresses. Regular Expression: Ensure that the text contains or matches a certain regular expression. (Regular expressions are powerful, but require some know-how. Limit to one response per column: Ensures that an option can only be selected once per column. For example, if you have 3 columns that contain bed firmness ratings labeled “too hard”, “too soft”, and “just right” along with 3 rows of names (Mama, Papa, and Baby), then this validation will make sure that each bed is only chosen once (in other words, two people can’t select a bed that’s “too soft”). If you’ve already made a form you can convert it to a quiz by following these steps below. You can make an answer key for all types of questions, except for grid questions. Fill out your question and answers. In the bottom left, click ANSWER KEY. In the top right of the question, choose how many points the question is worth. Note: To go back and edit the question or options, in the bottom left, click EDIT QUESTION. Open a quiz in Google Forms. Note: To look at individual responses, click INDIVIDUAL. Under “Respondent can see,” check the boxes next to the options you want. Immediately after each submission: Choose this option if you want people to get their results right away. They will click “View scores” after they submit their answers. Later, after manual review: Choose this option if you want to email results to respondents. Click SEND EMAILS AND RELEASE. At the top right, click RELEASE SCORE. If you collect email addresses, you can assign points and leave feedback on individual responses to send later. After you grade a response, be sure to save your changes. To move between responses, click Previous or Next . Find the question you want to grade. In the top right, enter how many points the response earned. Under the answer, click Add individual feedback. Enter your feedback and click SAVE. When you’re ready, you can email scores to individuals. To work on your form with WWCSD staff all you need to do is share your form (or quiz). As with any Google document, people can make changes at the same time, and you’ll see their changes after they happen. When you’re done editing your form, it’s time to start gathering some answers. 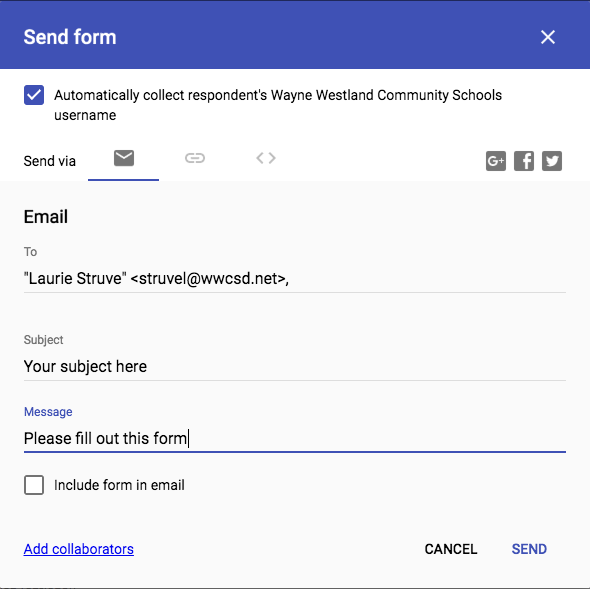 Here is how to share the Form so it can be filled out. Click the SEND button to get the following screen. The default send option is to send the form vial email (or a group of emails). As pictured here, you can send the form (as a link that will open in its own window) to specific emails with your subject and message. 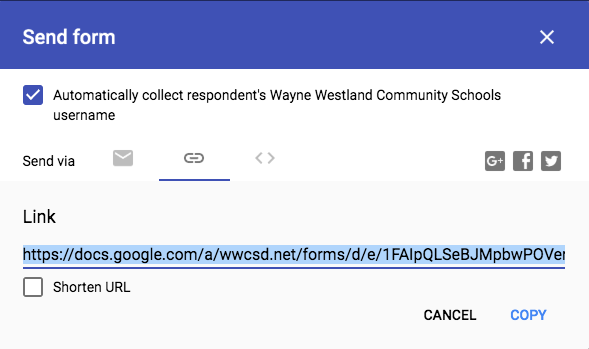 Alternatively, you can also check the Include form in email and you’ll be able to basically embed the form inside the email instead of the link option. Another option for sending your form is by a link, which is almost the same method as the example above. This is useful especially if you have a mail list that’s not incorporated in Google… so this method can save you time in that regard. Finally, you can embed the form inside of an HTML web-page. If you want to have this form placed on a website, or your blog, this would be the option to go with.